During our three days in Siem Reap, we developed a strange kind of routine. We would get up at four in the morning, drive to Angkor for sunrise and walk around the temples afterwards. Then, shortly before ten, we would leave the park and make it back to the hotel just in time to still get breakfast. After a nap, we would be back for sunset. Angkor Wat is without doubt the most famous temple in the park of Angkor. It dates from the 12th century and is the largest religious monument in the world. Upon entering, you will climb up several levels. On the lower levels, you will find wall carvings depicting religious scenes. On the upper level, you will get into the temple itself. Only a certain amount of visitors is allowed to be up there at the same time, so you might have to queue for a moment. Located close to Angkor Wat, this was the second temple we visited. Built as a Buddhist temple by King Jayavarman VII, it was later modified to include the beliefs of his successors. The temple is famous for its 216 stone faces. 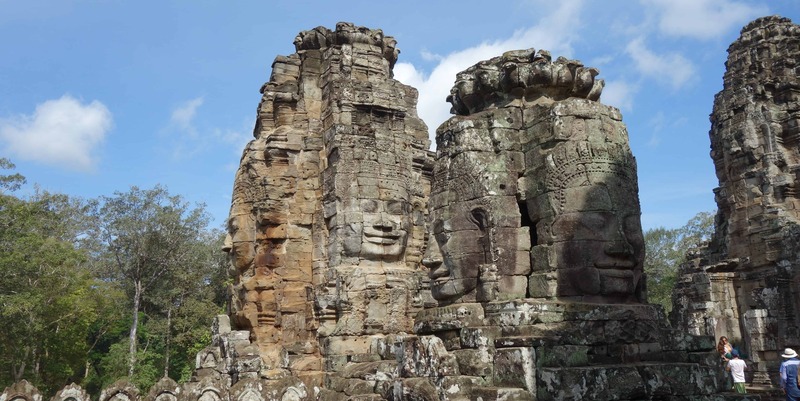 One theory describes them as faces of the boddhisvata of compassion, while another theory claims they might be the face of King Jayavarman VII himself. Whatever the case, the temple is fascinating to look at. Don’t miss the bas-reliefs on the outer walls that depict a mixture of scenes of mythology and daily life back in the time. 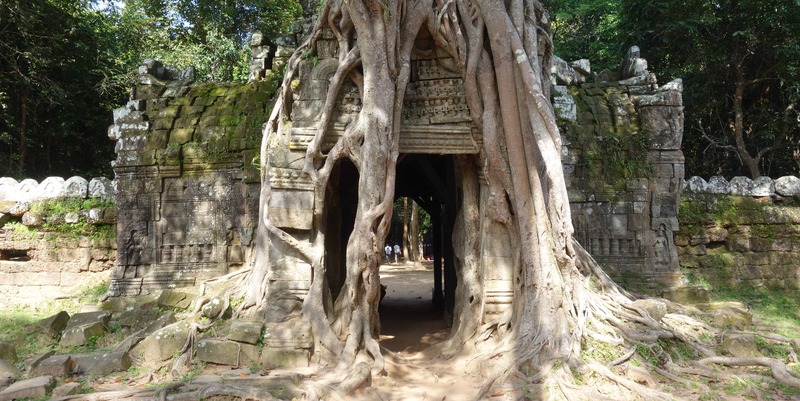 Ta Prohm, also called the jungle temple, is, after Angkor Wat, the second most famous temple at Angkor. Tomb Raider was filmed here. With trees growing on the ruins, it is especially spectacular and atmospheric. Ta Prohm was built by the same king who built Bayon. The complex was used as a Buddhist monastery and school and dedicated to the king’s mother. A stele records that more than 12.500 people used to live here. 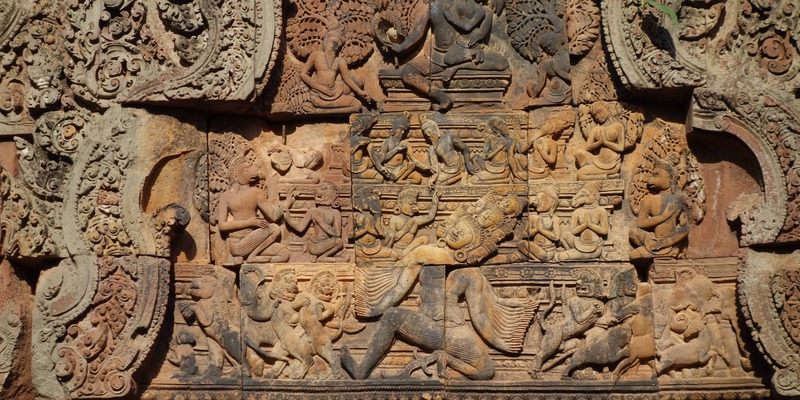 Located 25km away from the other temples, Banteay Srei is totally worth visiting. Built out of red sandstone, it has some of the best carvings in the whole of Angkor. The temple was built in the 10th century and is dedicated to the Hindu god Shiva. Banteay Srei means Citadel of Women and our guide introduced the temple to us as the “Pink Lady Temple”. The name most likely comes from the intricate carvings and the temple’s small size and has nothing to do with the complex being used by women. Preah Khan is huge. 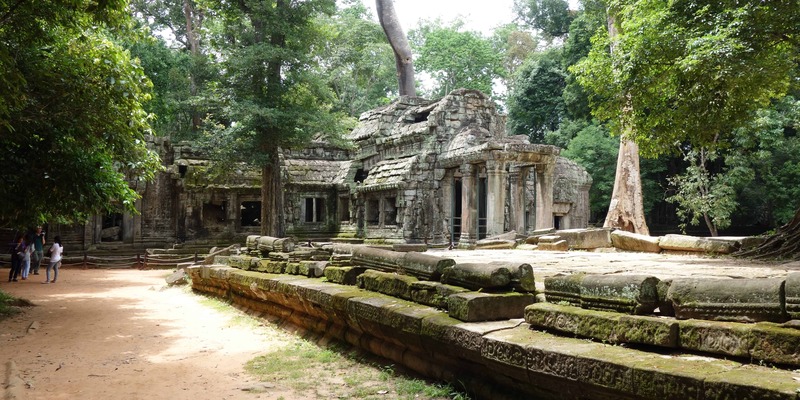 If you liked Ta Prohm, I think you will also enjoy this temple. Overgrown with trees and crumbling down, it is a place where you can easily get lost. 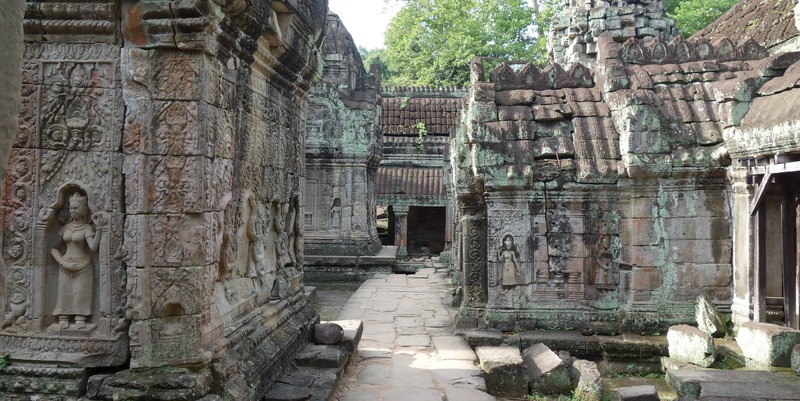 The complex was built by King Jayavarman VII, the same king who built Bayon and Ta Prohm, and it was dedicated to his father. The huge complex also houses shrines of 430 other deities, and when it was at its largest, almost 100.000 people lived here. It is no surprise that the temple managed to collect a large amount of wealth back in the time. 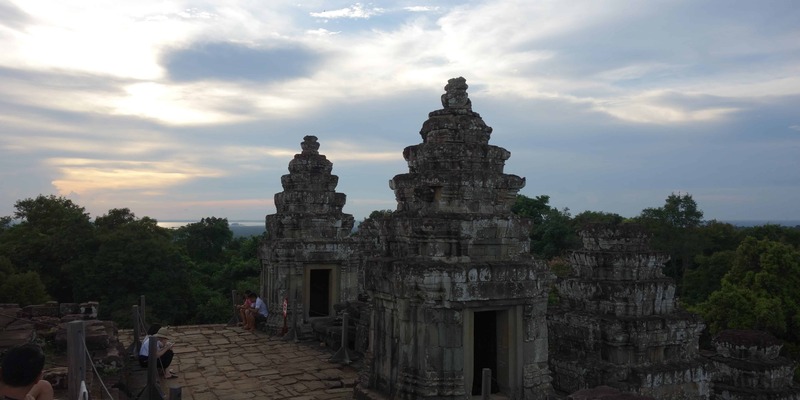 Pre Rup is a Hindu temple dedicated to the god Shiva and it is both a popular sunrise and sunset spot. It dates from the 10th century and the pyramid in the middle is 50m high. 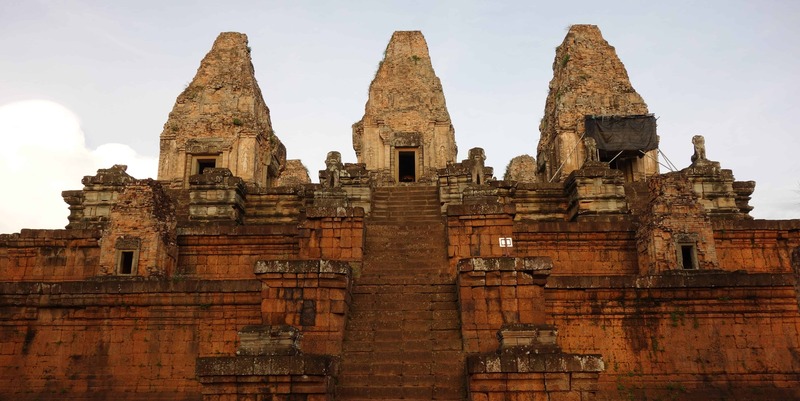 If you climb up the steps and look at the northeastern tower, you will find an inscription of King Jayavarman VI. It is the only proof at Angkor that he ever ruled there. Phnom Bakheng is a popular sunset spot in Angkor. Located on top of a hill, it is both a Buddhist and a Hinduist temple, dedicated to the god Shiva. 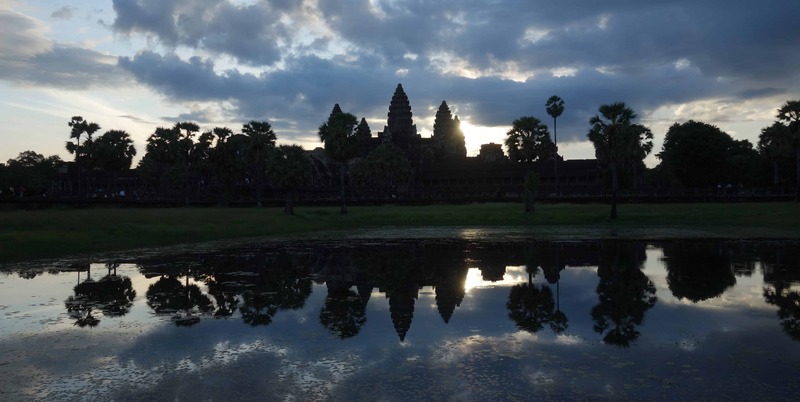 It was constructed in the 9th century, more than two hundred years before Angkor Wat, and historians belief that it was once the most important temple in the region. The location on top of a hill represents Mount Meru, the mountain where the Hindu gods live, and the seven levels are the seven heavens. Ta Som might be smaller than most other temples, but it is still worth a visit. Overgrown with trees, it looks similar to Ta Prohm. And just like Ta Prohm, and so many other temples at Angkor, it was built by King Jayavarman VII in the 12th century. It is dedicated to the king’s father. The temple’s restoration did not start until 1950, when archaeologists began securing the structure to keep it from collapsing further. Of course, there are many more beautiful temples at Angkor and you can easily spend a week exploring them. Which one was your highlight?